‘Imagine a runnable 3-4km route, not too technical, with enough elevation to sort out the runners. Imagine a race that starts in the dusk of an Autumn Saturday evening, and ends in full darkness. 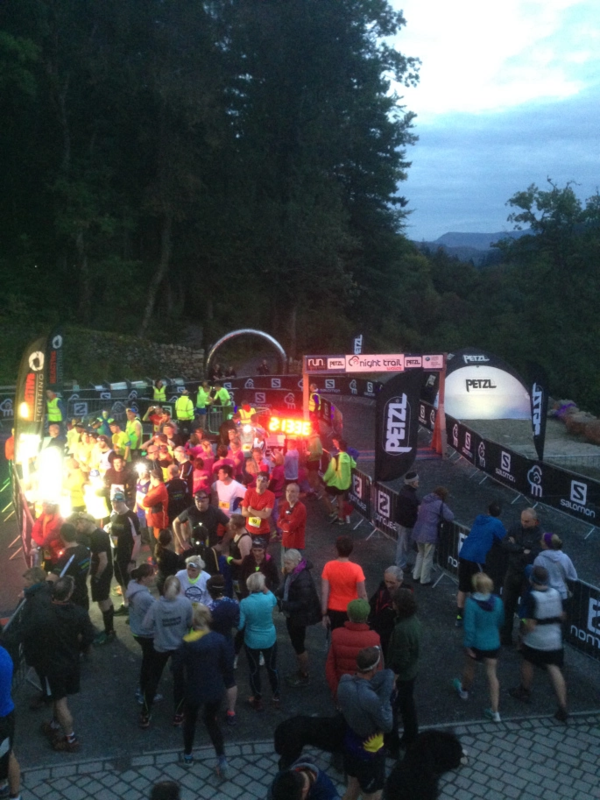 Imagine an event with a real party atmosphere, with a DJ, bar, hot food and a race arena lit up with flood lights.’ That’s how runcoedybrenin.com plugs its annual night race and it all sounds a bit too good to be true. When completing the application online, we chose the ‘relay’ option as opposed to the ‘solo’ one and scanned the website for any other important information as we’d never really done anything like this before! 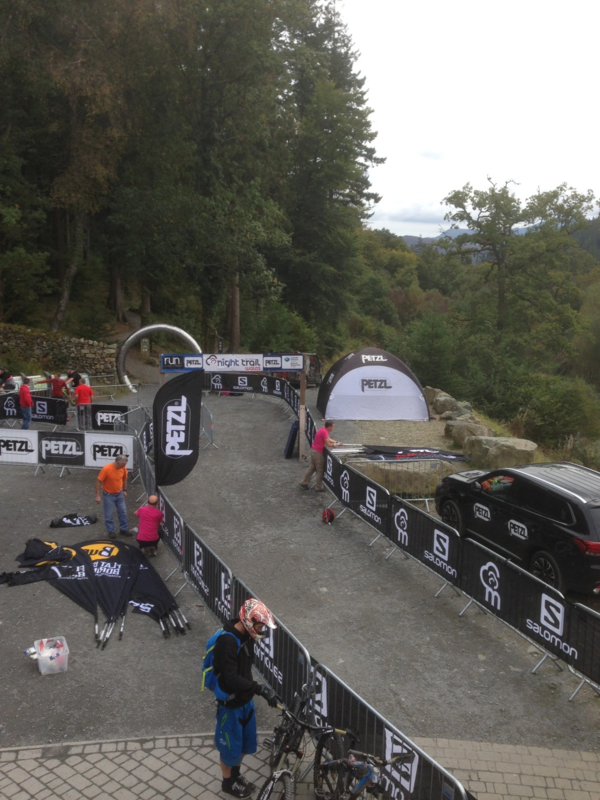 We arrived at Coed y Brenin a good four hours before the start time to get our bearings and explore the route. It descends from the centre, down through the woods to the Afon Eden (River Eden); following its winding course through the dense pine forest. We hadn’t come to any inclines yet and it all seemed a bit easy, albeit at walking pace. When suddenly, whack! The bit on the website that said about elevation sorting out the runners stood right in front of us like a big brown, slippery wall of hell. It was a steep up through chunky tree roots and thick mud. We decided to give this leg a miss on our reconnaissance as it would require all of what we had to get up it as many times as we could in the race. We skirted round it and joined up the route further along the trail. 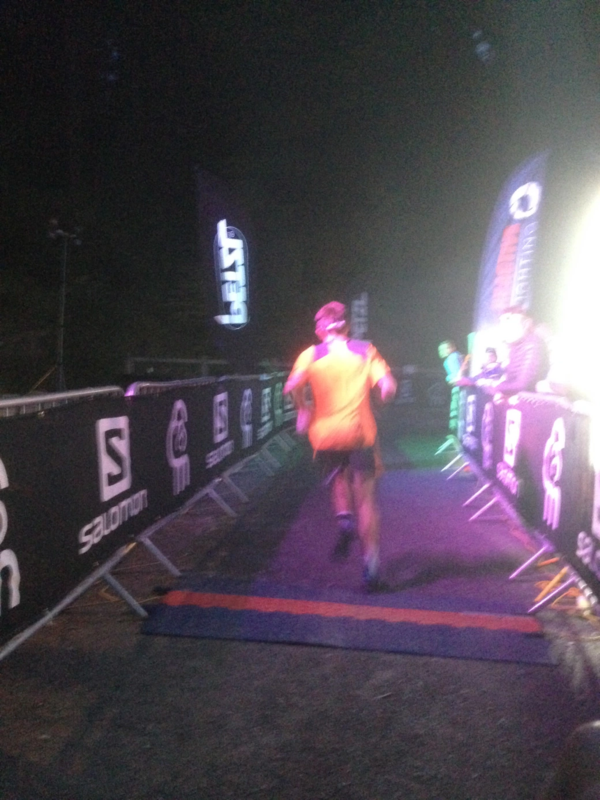 The last leg of the route descended gradually through the forest and back to the centre, where we would hand over the electronic wristband to the next runner in our team. Our aim being to collectively complete as many laps as we could, in three hours. Arriving back at the centre, the mountain bikes were being put back on roof racks of all shapes and sizes as colourful runners began to filter in to register their arrival. After registering we made our way to the start/finish line where over the PA system we would be briefed on the race requirements and some safety info. 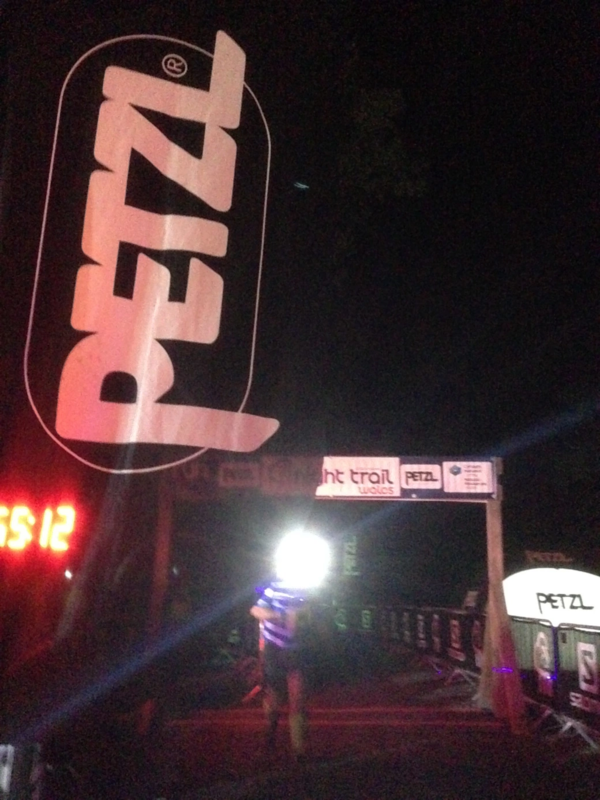 The event, held annually and sponsored by Petzl, requires that runners have a head-torch to find their way through the forest in the dark. And with the sun setting and some stars coming into view, hundreds of LED lights began to fill the race arena. We sorted out between us what order we were running and I opted to run second. My mate Ziggy took his position amongst the first of the relay runners and the pumped up solo nutters at the start line. The announcer signalled the start of the race with a klaxon and a big “Ffwrdd a chi! !” – ‘Off you go! !’ in Welsh as the huge digital timer in the arena began counting down from 3:00:00 and the DJ kicked it all off with an apt choice of track in the form of ‘At Night’ by Shakedown. After about twelve minutes some of the solo runners appeared, flying down the narrow passage in between the barriers separating them from the spectators, past the feed station and towards the finish line to a huge roar and shouts of encouragement from the crowd who were in party mode. The solo runners were proper athletes who, like the relay entrants, try to complete as many laps as they can in the three hours but don’t have the luxury of a break whilst their team complete their laps! I positioned myself in the ‘transfer’ paddock where I would receive the wristband from Ziggy when he returned. The first of the relay runners returned to the arena looking destroyed and most of them being from running clubs! I started feeling nervous as our third team member, Chris, who was keeping lookout for Ziggy, gave me the signal he was here! We swapped the wristband awkwardly and I flew off down the trail with my head-light fanning white light across the forest floor as I went. I knew my first lap was my chance to get my fastest lap and a good start on the board for my team. I sprinted down towards the river, passing people in a flurry of adrenaline, skipping over roots and ducking under low branches, making sure I kept something in the tank for the big climb that wasn’t far away. The music from the arena had faded away and the only sound was the soft thud of my new Salomon’s on the pine needle floor. With the course looking completely different in the pitch black I relied on the reflective yellow arrows and on course stewards to direct me on my first lap. Arriving at the muddy wall of death, it was carnage. A bottle neck of strugglers trudged up the hill pulling themselves up on trees with the traffic from the first wave of runners turning the incline into more of mud fest than before. I tried running at first but my legs kept slipping backwards and I felt the energy draining from me as fought against gravity and sludge. I decided that big strides would be best to get to the top and I would resume running when I got up there. The top was the highest point of elevation on the course and after a brief plateau the trail descended back towards the centre with the music coming into earshot in the distance. I went for it. Going at a good pace downhill for what seemed like ages making sure my legs didn’t run away, a fall here would be highly embarrassing as I entered the arena to some cheers and high fives as I sprinted down the narrow passage across the line passing Chris the wristband and feeling happy with my time of 18:52. I’d said before the race that I would be happy with a sub twenty minute lap, so having achieved that I made my way to the feed station for some banana chunks and energy gels and to catch up with Ziggy to talk about the route, thinking to myself ‘This is awesome’.